SocioHabitat has its own website! SocioHabitat International is a Canadian company that makes affordable steel homes. SocioHabitat International houses can be used to meet a housing shortage, to provide emergency housing or to serve as temporary homes for people working in remote areas. 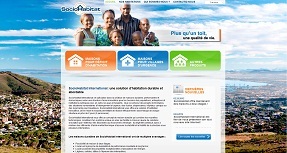 The trilingual site (English, French, Spanish) was designed with three different backgrounds, to illustrate the many uses of SocioHabitat International's sustainable homes. The site, which has a portfolio and a News section, can also be modified by the client independently via a content management system! The content of the site is also optimized for search engines.